Dementia is a complicated umbrella of diseases. Whether it’s the science of the brain itself, or the quality of life issues that affect people with dementia and their caregivers, there are many different and difficult challenges to consider. It’s not surprising then, that there are a number of different areas within dementia research—everything from diagnosis to therapy to caregiver support. The variety of challenges that come with the disease means that dementia researchers must be able to cover a wide ground to find solutions, like an effective drug to treat dementia. So, what if we can make it easier for them to find those solutions? That’s where my research comes in. As an Assistant Professor in the Electrical, Computer and Biomedical Engineering Department at Ryerson University, I specialize in medical image analysis and machine learning technologies. I run my own lab on campus, called the Image Analysis and Medicine Lab (IAMLAB), where we design algorithms to analyze large amounts of neurological data and extract quantitative biomarkers—basically, signs in your body that scientists can measure to figure out the possibility of disease. What does that mean? To put it simply, we look at data. Large amounts of data, including data from people with dementia. And then, we try to spot the patterns in this data, patterns that may be beneficial for other dementia researchers. By identifying common patterns, like similarities in the brains between two people who have early stage Alzheimer’s disease, we might be able to help researchers investigating early detection of dementia, for example, or determining the course of the disease. Essentially, image analysis means extracting insights from an image. It’s how we process and quantify things from raw data. When you are taking a picture of yourself with your smartphone and it recognizes your face—that’s image analysis in action. At my lab, we look at pathology images (think of the cells you’d examine under a microscope in science class) and radiology images (like an x-ray, or an MRI). Through machine learning, computers are able to learn by themselves—a basic form of artificial intelligence. It might sound scary, but machine learning is a huge benefit for researchers. Instead of taking the time to analyze all that data ourselves, we can program the computers to follow algorithms—a problem-solving to-do list—so they can do the job independently. This gives us a shortcut to results, as machine learning allows for a quicker and more efficient way of analyzing those large amounts of data. To sum it all up, we use image analysis to measure biomarkers from data, then use machine learning to analyze trends, and pick out patterns that can tell us useful information about dementia. 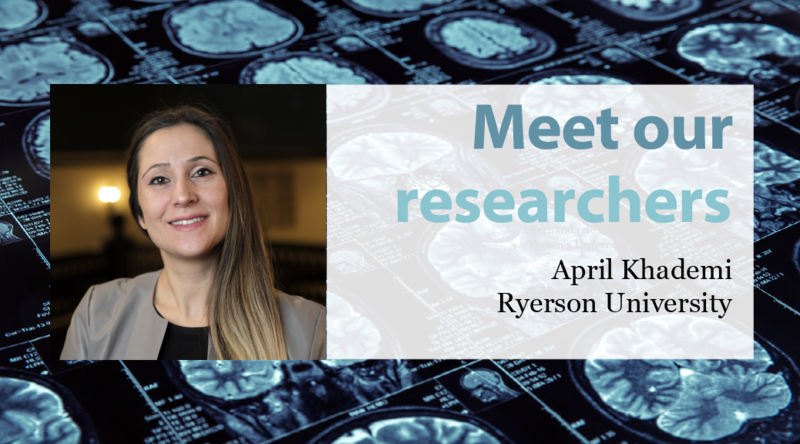 Video: April Khademi, Associate Professor in the Department of Electrical, Computer, and Biomedical Engineering at Ryerson University, talks about her research on medical imaging. Most recently, Dr. Khademi participated as a peer reviewer in the 2018 ASRP Biomedical Panel. So, if you or someone you know has dementia, how is this research valuable for you? Consider the example of a researcher or pharmaceutical company that wants to run a clinical trial to test a new drug for dementia. One of the biggest challenges they’ll face is finding volunteers to participate in the trial. They’ll be looking for a very specific group people with a particular type of dementia at a certain stage—from early MCI to full-blown Alzheimer’s disease. With the tools developed in my research, we would be able to identify each disease’s specific characteristics and automatically group together volunteers who have the exact same disease (and stage of the disease). This would mean more robust and optimized clinical trials, ultimately leading to better treatments for dementia. By making it easier for researchers to tackle these problems, hopefully we can solve some of the challenges faced by people with dementia and get closer to a cure. Learn more about the research we fund.